Saturday morning cartoons were a staple of my childhood. From time to time a new cartoon would appear for a season or two, then disappear. Such was the case with King Arthur & the Knights of Justice. From what I remember, this was a great cartoon. Great enough, in fact, to merit a three-issue mini series released by Marvel Comics to help promote the series in the early '90s. A comicbook mini-series, based on a Saturday morning cartoon, published by Marvel Comics usually finds a way to fail miserably. The premise is lofty, to say the least. A college football team, lead by quarterback named Arthur King, is transported back in time by Merlin to help defend Camelot and save the real King Arthur and his knights. After landing in medieval Camelot, the former football players-turned-knights suit up, putting on the armor of their imprisoned counterparts, and start beating up bad guys. By the end of this mini-series, Lady Guinevere has been saved, but the true King and his knights are still held prisoner by the evil sorceress Morgana. Arthur and his new knights vow to defend Camalot, free King Arthur, and return home, someday. Let's start with the writing. The pacing of the story may or may not be the writer's fault. Since this is a mini-series based on a cartoon series, there was most likely a predetermined start and end point put in place. The ending is designed to peak intrest, getting readers motivated to watch the cartoon. So the fact that almost nothing is solved by the final page is understandable. The dialouge, however, can be blamed on writer Mike Lackey. A professional comicbook writer should be able to tell an entertaining story, regardless of start and end points. I cannot say much about Lackey's other work, because I am unfamiliar with it, but King Arthur is laughable as far as dialogue goes. In the first issue, the only black player on the football team says on the bus ride after the big game, 'Hey, dig this rap I just scratched! Check my man Arthur he be chillin with a sassy play dat do be killin he made Rhode Island look like a silly clown as he razzmatazzed 'em with a sixty-yard touchdown!' Yes, you read that correctly. The artwork by artist Keith Wilson is sub-par as well. The action looks fine, and the Knights themselves look sharp. However, the human faces look cartoonish, but not in the cool saturday morning cartoonish kind of way. The faces look like they belong in a Disney comicbook. Especially the faces of the football players while on the same bus ride mentioned previously. It is easy to see why the fight scenes contain characters wearing helmets covering their full faces. Somehow, I managed to make it through these three issues of this. 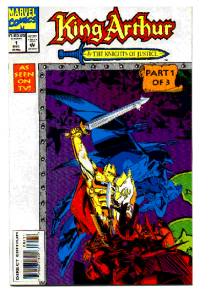 While there is no love lost for the cartoon series itself, the King Arthur & the Knights of Justice comicbook series will likely find its way to the bottom of my collection, never to be read again. Good ridance.